Mozart Quintet for Piano and Wind. Schubert Piano Impromptu in Bb. Beethoven Quintet for Piano and Wind. When Mozart's Quintet in E flat major for Piano and Winds was premiered in 1784 in Vienna Mozart wrote to his father that “I myself consider it to be the best thing I have written in my life,” a rare pronouncement even from a composer hardly loath to praise his own creations. Beethoven was clearly inspired by the piece and in 1796 he composed his own tribute for the same combination, also in three movements like the Mozart piece. Whereas Mozart works very hard to integrate the piano with the other instruments so that they all share melodic interest, Beethoven saw this clearly as a vehicle for his own pianism, and the piano style is often brilliant and dramatic. Guy Donaldson will also continue the Viennese theme with a piano solo – an Impromptu in B-flat major by Franz Schubert. The piece is essentially a theme with variations. It is as if the main tune dresses up in different music costumes, and often is so heavily disguised as to be almost unrecognizable. Reiko Baugham hails from Southern California. 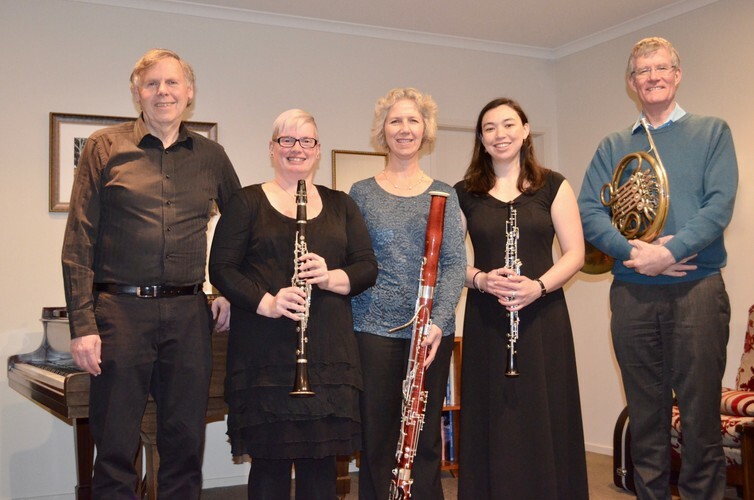 Following graduation from Carnegie Mellon University she played both oboe and alto sax with different community groups in New York City for several years, until she moved to Palmerston North in 2013. She eagerly joined the Manawatu Sinfonia as an oboist and has since joined the Manawatu Concert Band. Ingrid Vlieg was educated in Palmerston North and was taught clarinet by Eldon Ormsby. She studied clarinet performance at Victoria University under Marina Sturm and Deborah Rawson. Ingrid played for the Royal New Zealand Air Force Central Band. She later joined the Capital Performing Arts Orchestra where she held the position of Principal Clarinet. She was also often a soloist with the orchestra. Ingrid performed in last year’s Globe series. David Pearce started his musical career as a tuba player at Palmerston North Boys High School. He was quickly promoted to the NZSSSO and the NZ Youth Orchestra for several years. When he moved to The Netherlands with his wife Milja, he played tuba in orchestras in Delft, The Hague and Amsterdam. Returning to Palmerston North in 1994 he joined the Manawatu Sinfonia and later took up the horn. He has been the Sinfonia first horn for a number of years. Milja Albers-Pearce started her bassoon playing under the tutelage of Neville Forsythe in Christchurch. She progressed through the Christchurch Youth Orchestra, NZSSSO and then the NZ Youth Orchestra and Christchurch Symphony Orchestra. When she moved to The Netherlands in 1990 with her husband David they were fortunate to play with orchestras in Delft, The Hague and Amsterdam. Since moving to Palmerston North in 1994, she has played in the Manawatu Sinfonia as well as occasional smaller groups. Guy Donaldson received his formative piano instruction from Maurice Collier, and then at Canterbury University with Maurice Till. In 1984 he studied in London with Paul Hamburger and Roger Vignoles. Guy was a senior lecturer in music education at Massey until 2004, when he took leave to pursue his passion for performance and music teaching. He is active in the Manawatu as a teacher, adjudicator, piano soloist, accompanist, chamber music player and music coach, and is musical director of the Renaissance Singers. Admission is by donation (recommended from $5).